We can advice you with a pleasure the first litter of our lovely Jomi is born 29.06.2007.
and five females (three black with white marks and two sable). Napoleon is a very beautiful young male with excellent character. 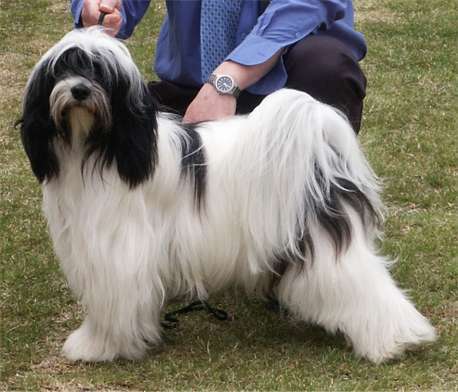 He is bred by Mrs. Pirjo Mäki, Finland - kennel Pam-Zamirin, and is owned by Robert Turak, kennel von Shangri-la and Arpad Csernok, kennel Tibetan Symbol, Hungary. 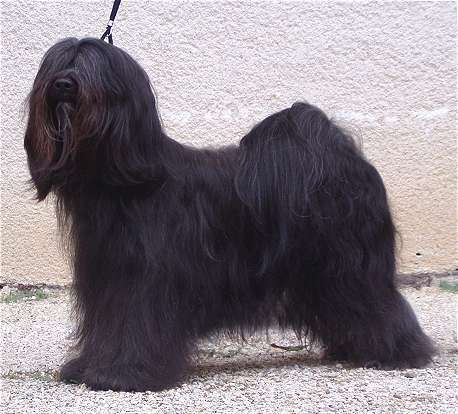 His father is a wonderful French male CH Shakra Patan Kuo Yarlung Namtso. Her mother is Araki Evil Miss Goldshoes, from the English top winning kennel Araki. Napoleon is eyechecked (free of PRA, PLL, cataract), HD-A (free of dysplasia), PL-0/0, ED-0/0. Jomi is bred by us, she is not only nice and show successful, but also has very lovely character. Her father is a splendid German male Multi CH Tschal-pa von Nama-schu (Multi CH Silgarhi Varius x CH Cchag-la Sämo Bodjul CS). Her dam is our Multi CH Amox Sissybar (CH Karamain La Fontaine x CH Amox Delicious Shag), from the old finnish bloodline. Jomi is also eyechecked (free of PRA, PLL, cataract), HD-A (free of dysplasia), PL-0/0 (free of patella luxation).